If you're a fan of anime and manga girl dress up games or if you want to dress as pretty as girls in cartoons and animated series, anime girl dress up games, come to join this makeup salon makeover simulator game and you will love to be the top fashion designer. In this fun anime fashions you're both a fashionista and a fan of anime comics and of japanese pop culture, this new styling and beauty Game is for you. prepared amazing outfits for anime Girl drawn in manga style. Start with make up for the beautiful virtual girl, then pick a fancy makeup, hairstyle, garments and accessories from an awesome virtual selection in this best anime girl dress up games, makeup and dress up simulation game. In this fun anime dress up game, cosplay fashion you get to style beautiful girl as fashion icon, models and superstars for upcoming princess wedding in this anime dress up game for girls, fashion simulator game for anime girls for free! Girls are going to hold a fashion show in anime parlor theme, Start dressing up animatronic dolls as you wish! We admire manga culture, especially the kawaii highschool girl look. This anime girl makeup Game Contains unique hair cutting and anime make up game for girls with mascara and blush, lipstick. Is the right makeover simulator game for girls, in this game you can create your own anime character by dressing and styling her, So if you love beauty and styling games, be sure to check this new anime fashion app for young fashionistas. There are anime doll model on the screen, and then assemble glam outfits from a wardrobe of luxurious, stylish apparel. When you play dress up and makeover games for girls you train your skills in stylist and fashion designer profession. Dress anime girls they are gorgeous anime-kawaii fashionistas. Features: - You can pick a fancy hairstyle and put together an excellent combination of fitting clothing, Design a unique look. - Best make up and dress up options for you to choose from, you can spend as much time as you'd like making your character as awesome as possible. - Two sections for your anime girl: make up and dress up (Pretty outfits, fashion styles , hairstyles for your anime model ) . - New accessories, clothes, to create your unique style. - Create your anime girl style from best of outfit combinations using a nice collection of suits, shorts, shoes with high heels, dresses, pants, skirts, shorts. 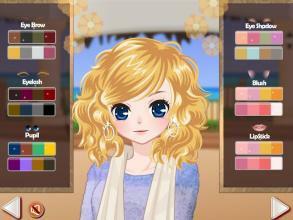 - Choose your kawaii style by selecting a best outfit to wear Using a fashion combinations to make the girl beautiful. - Add accessories including purse, necklace, earrings, headband for your anime or kawaii girls. to complete your character’s outfit. - You can also change your Awesome Hairstyles with braided looks and color, along with a new eye color for the right look. All otakus of comic, chibi princesses and high school anime girls will enjoy the familiar short-skirted schoolgirl look on anime girl makeup games, You'll love the awesome anime graphics, and the trendy and fashionable outfits! what are you waiting for ? 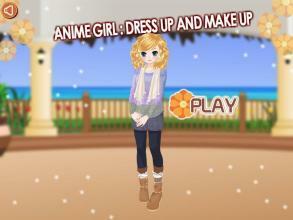 Be the star fashion designer, try your skills on this anime girl dress up game as outfit designer now! by dressing up cuties cartoon in impressive attire and creating gorgeous looks with hairstyles and makeup in your beauty anime girl makeup game salon. After completion of each stage press the Next button in the bottom when you've finished designing outfits. If you want to find other amazing And free fashion and makeover and doll dress up games for girls You Can Press "more games" to download Best Dress Up Games for Girls and play more of our salon and cosplay apps for Android. We've got many Games with glamour celebrities, actresses, supermodels and stars. Our games let you dream of being a famous supermodel of the podium, rising to the top charts of trendy fashion magazines. In each game, there are A lot of hairstyles, dresses, accessories, tops, skirts, shoes, jewelry, kawaii leggings, tights.